Android: Enable or Disable Background Data - It restricts you from multitasking; your WhatsApp gets the messages only you open it; you can't download the songs in the background. Most of the Android apps installed on your smartphone requires the access of Internet or data even if they are not being used or in the background like multitasking. For example, the WhatsApp on your mobile is always ON in the background to get new messages, likewise, Gmail, Facebook apps are also configured to run at regular intervals. Turning to "Restrict Background Data" also restrict from getting updates and notifications from the apps, and you may think that the phone internet slows down. On the other hand, there are some other apps which don't require any data, wifi or mobile network to use for their operations. Also restricting background data will also stop ads from popping up on my Android phone for selected apps. But how to disable restrict background data? 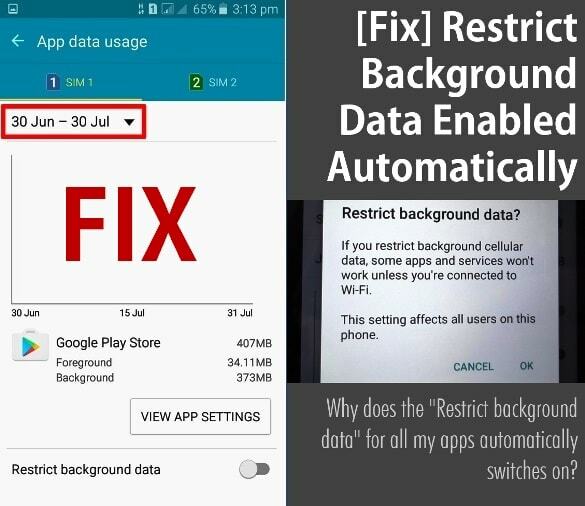 How to fix auto enabled problem to restrict background data Lollipop? How to restrict background data? No worries, follow this page to solve "Restrict Background Data" automatically turned ON error. And this also works with Marshmallow, Nougat, Oxygen OS. Last time you have seen; Quick 12 Tips To Save, Improve, Boost & Extend Mobile Battery Life and today we are going to sovle one of the critical issue on the Android phone performance facing most of new Lollipop users. How to restrict background data - Android phone tips and tricks - While working on the android applications development, I have seen most the apps are coming in future that mostly are going to demand the internet from mobile data or WiFi. So you essentially need to fix this issue of restrict background data automatically on as early as possible. And it's not that much hard. This issue is encountered just because of your base settings in your mobile data. Step 2: Here you need to change the month dates and make the start date from today. Suppose today is 12 July then make it "12 July - 12 Aug." Because the Android system assumes that you have sufficient data, remain to use this disables the auto operation of mobile data restriction. Go to the next step. Step 3: Disable all restrictions. Step 4: IMP STEP: Switch OFF DATA/MOBILE INTERNET. Check now; your issue has to be solved. Now onwards, your app will able to use your data or internet whenever they required to update you. If you know any other way to solve how to restrict background data, then you can share it with me via the comment section shown below.